SOWERBY BRIDGE Snails’ Sean Suttle helped lead a strong Calderdale challenge at last Sunday’s Simply Health Great North Run, the world’s biggest half marathon. 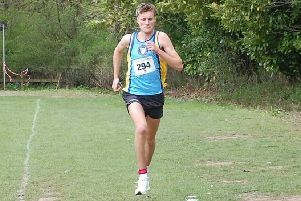 Suttle was one of 44 runners from Snails in a field of 57,000 in the north east and continued his recent fine form by finishing 133th in 1:22:18. A number of Snails were running a half marathon for the first time while others achieved a personal best for the distance. Five members of Halifax Harriers also travelled to Newcastle for a race in which the majority of runners are out to raise funds for their favourite charity or just to experience running with thousands of other people. Marc Rocheteau clocked their fastest time - 1:44:47 - while Deke Banks fared best of the Northowram Pumas’ contingent in 1:36:13. Fast times are hard to achieve due to the number of runners. Snails results: 133, Sean Suttle 1:22:18; 3407, Chris Hanley 1:47:02; 3643, Chris Smart 1:47:51; 4942, Gary Taylor 1:51:43; 5204, Terence Lamonby-Smith 1:52:26; 6206, David Collins 1:55:06; 6513, Kevin Carse 1:55:51; 8817, Tom Oddy 2:01:05; 9413, Dave Redhead 2:02:23; 9899, Rebecca Pollard 2:03:27; 12712, Lynda Shaw 2:08:55; 16465, Daniel Priestman 2:15:20; 17293, Hannah Priestman 2:16:43; 20364, Lucie Fenton 2:21:54; 20700, Lesley Rushworth 2:22:28; 21841, Laura Armstrong 2:24:24; 22266, Jayne Talbot 2:25:04; 24645, Adele Harris 2:28:57; 26674, Nicky Brown 2:32:28; 28101, Ellen Battye 2:35:04; 28105, Amanda Aveyard 2:35:04; 29810, Ella King 2:38:22; 30036, Richard Aveyard 2:38:48; 30215, El Ogilvie 2:39:10; 30971, Wendy Evans 2:40:38; 31144, Julie Browne 2:40:58; 35071, Miriam Caldecott 2:50:33; 35305, Brian Crowther 2:51:13; 36436, Amy Haswell 2:54:49; 39588, Gail Oldroyd 2:53:21; 36977, Rick Ogilvie 2:56:42; 36993, Amanda Smith 2:56:45; 36994, Nicki Paynter 2:56:46; 37428 Emma Suttle 2:58:13; 37545 ,Richard Frost 2:58:40; 39903, Claire Goddard 3:09:50; 40833, Karen Eames 3:15:54; 41853, Vicky Lowcock 3:25:33; 42885, Lindsay Hibbert 3:44:49; 42886, Sheila Ryder 3:44:49; 42887, Jodie Smith 3:44:50; 42888, David Gee 3:44:51; 42889, Jenny Starsmore 3:44:51; 42996, Jeremy Starsmore 3:49:06. Harriers times: Marc Rocheteau 1:44:47, Jazz Sandhu 1:49:42, Samantha Layfield 1:59:43, Paul Bunker 2:00:14, David Cooper 2:06:14. Pumas times: Deke Banks 1:36:13, Kirsty Edwards 1:46:46, Andy Haslam 1:47:38, Julie Bowman 1:49:05, Simon Wilkinson 1:53:04, Andrew Tudor 1:53:06, Sarah Haigh 1:59:03, Victoria Owen 2:00:29, Chris Ellis 2:00:29, Dawn Higgins 2:11:17, Glenn Ackroyd 2:11:38, Jodie Knowles 2:11:56, Andy Barnes 2:14:25, Peter Reason 2:16:28, Tiffany Lewis 2:17:56, Sarah Firth 2:20:48, Lisa Bognar 2:21:13, Melissa Hall 2:22:32, Alison Shooter 2:28:45, Beth Pattinson 2:36:11, Brett Swiffen 2:41:33, Gill Holmes 2:49:59, Emma James 3:04:48, Dean James 3:07:47, Rachel Calvert 3:16:42, Fiona Averill 3:21:54, Katharine Barnett 3:56:05, Catherine Farley 3:56:06. Twenty Halifax Harriers went to Sherburn in Elmet for the Vale of York half marathon. This race has grown in size over the last five years and attracted some 2000 runners. The race has only about 50 metres of elevation and eight Harriers set personal bests. Conditions were ideal for the first 11 miles but there was a stiff head wind into the finish. Harriers times - PBs: James O’Rourke 1:29:03, Keith Lemon 1:40:38, Nigel Taylor 1:44:53, Sophie Baxter 1:46:24, David Parrington 1:52:57, Stefanie Dickinson 1:58:21, Deborah Kirkbride 1:58:27, Audra Naylor 2:17:08. Others: Michael King 1:26:16, David Ingle 1:29:31, Mark Crabtree 1:32:05 (3 rd M60), Rachael Beaumont 1:38:43, Simon Lea 1:40:30, Margaret Deacon 1:52:04, Hanni Maeer 1:52:30, John Moore 1:57:32, Andrea Ackroyd 2:01:11, Susan Hall 2:15:48, Jenny St Romaine 2:17:10, Martin Haigh 2:21:21.Queensbury times: Simon Brady 1:28:42, Joanne Horan 1:33:46, Leanne Alston 1:44:10, Peter Wood 2:19:36, Sharon Elliott 2:33:57, Dave Elliott 2:33:57, Kirsty Russel 2:34:16.